When I first heard about tonight’s gig, at the back end of last year, it was my first “must see” gig of 2013. 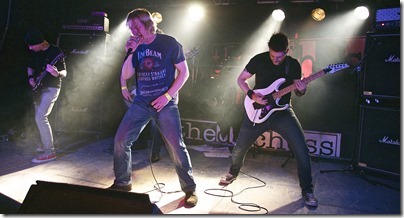 Morpheus Rising and Also Eden had previously shared the bill in York at Fibbers for the late-2011 release of the former’s debut album – Let The Sleeper Awake – which, unsurprisingly, made my top ten of that year. That night, I also picked up also Also Eden’s full back catalogue and, while their 2011 release – Think Of The Children – didn’t quite make my top ten, it wasn’t far outside it. Not long before the gig, however, it was announced that Also Eden had had to pull out due to circumstances beyond their control (presumably the collapse of the Y-Prog weekend in Sheffield, which the band were due to play on the Saturday). My heart sank a little more when it was announced that Bastrad had been recruited as a replacement on the night. I had seen them twice before, both times supporting Morpheus Rising and, while past reviews showed that I was warming to them, they didn’t exactly fill me with as much excitement for the evening as Also Eden. My main criticism in the past seems to have been that the vocals were a bit strained. 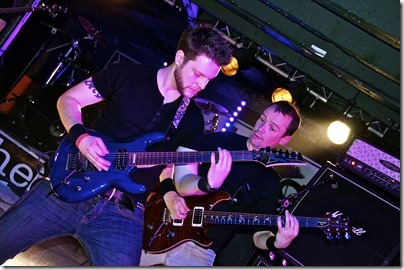 This time out, there had been a change in the line-up, with guitarist Martin Drury taking over vocal duties and Steve Bull replacing previous vocal Tristan Fayers on bass. There is a youthful exuberance to Bastrad’s performance and it sort of straddles the line between fun (which, let’s face it, is the raison d’etre for most local bands – of any that think they are going to make lots of money and fill arenas, most are sadly deluded) and something bordering on immaturity. The first couple of songs were heavier than I remembered, mostly noise with a lot of running around stage and posturing. By the third song, however, I was becoming a bit more interested. This one opened with a bass line before continuing with pounding drums and some nice guitar work which made it slightly more atmospheric while somehow a little darker. The noisier, heavier sound soon returned, but with occasional glimpses of more interesting, melodic guitar work poking through. Also unusual was a lively drum solo courtesy of Martin Durrant, which led into a short instrumental section – I can’t think of many (if any) other local bands who have attempted, let alone made work, as long and impressive a drum solo as this one. Supernatural High was the first song title I made out (why do so many bands struggle to speak clearly between songs?) and the song itself had another nice bass line and some great fast vocals which, even if a little repetitive, proved that Bastrad have moved on since the last time I saw them. Another instrumental followed, this time a solo guitar was eventually joined by drums. Personally, I enjoyed it but the audience seemed to be becoming more ambivalent and a bit restless. The high energy Drive, a song I remembered from last time out, increased the tempo on stage again before the appropriately named Adios ended the set. Honestly, I enjoyed Bastrad’s set more than I expected to. Overall, they are possibly too far towards the heavier side of heavy metal, but this line-up seems to have overcome the vocal problems and tonight’s performance was, if not exceptional, at least entertaining. The band have an album (well, mini-album, according to the event details) launch coming up at Fibbers at the end of May and, you know what, I’m quite tempted. Tonight is the eleventh time I have seen Morpheus Rising and I freely admit that they are one of my favourite York bands (even if that is an ever-growing number). There is a kind of nostalgic appeal – I have mentioned before that some of their obvious influences, the likes of Iron Maiden and Saxon, are the sort of bands that first got me into music. Tonight’s line-up saw Andy Gooby (“Spare Andy” or “Stand-in Andy”) taking Andy Smith’s place on bass, presumably on a temporary basis. He has done so in the past and, whatever the reason, it doesn’t seem to upset the balance or camaraderie of the band – there is always a feeling of them playing with such ease and enjoying being on stage together. Pete, tonight sporting one of the new Morpheus Rising hats and, therefore, looking slightly comical and (it has to be said) gnome-like, plays guitar with a cheeky abandon while Daymo always appears more intense and contemplative. The two of them effortlessly trade guitar sections but it is when they play together and alongside each other that you can see just how tight they are, with fingers flying across the frets and across the strings in near-perfect union. Gibbo’s drumming is, as usual immense, but having the dual role of master of technology which, to say the least, isn’t behaving as well as it could do tonight, seems to be perturbing him just a little. Whatever gadget the band uses for their backing tracks (it looked like an i-Pod from where I was standing) seemed to crash, leading to tonight’s version of Fighting Man being performed without strings before help from off-stage was called to fix the problem. Simon’s vocals still seem to be growing and tonight, he had completely ditched the slightly nervous laughs which have punctuated his between song banter in the past, and I hadn’t noticed how off-putting they were until they had gone. But the best news? Peppered throughout a set of favourite tracks from Let The Sleeper Awake were the first new songs I have heard. Say Something had to be restarted due to mistakes in the first attempt but when it eventually got going it featured some nice wah-wah effects from Pete. It’s not radically different from anything on the first album, but just different enough to show progression. In some ways, especially from the snatches of lyrics that I heard clearly, Nameless sounds even more like Iron Maiden than any of the band’s other tracks while Bending Light has a bit more of an experimental sound. It includes an unusual guitar riff that I can only think to describe as “tinny”, although that makes it sound unpleasant and it’s far from that, as well as a section which Pete played by running some sort of gadget across the strings. I have no idea what it was or what it does (or even how to Google it) but it sounded nice. Mix these in with “classics” like Daylight, Quench Your Thirst, Fear Of Nothing, Gypsy King (with the usual exquisite guitar from Daymo), In The End, Save The Day, Shades Of Grey and the wonderfully grinding Lord Of The North and you have a great set. There’s no grandstanding or over-the-top posturing, just a nice, clean performance with occasional nods to the fans – Pete flings used plectrums into the audience (sadly my catching skills let me down and, despite the one thrown in my direction ending up at my feet, I didn’t react quickly enough to pick it up first) while Gibbo hands over his drumsticks (and flicks sweat into the crowd!) at the end of the set. Technical issues and mistakes notwithstanding, Morpheus Rising just keep getting better. Hopefully new tracks mean a new album is one the way. In the meantime, you can catch them live in York supporting prog band Panic Room on June 29th or Austrian rock band Cornerstone on August 9th, both at The Duchess (or at other venues across the country – see the website for details). 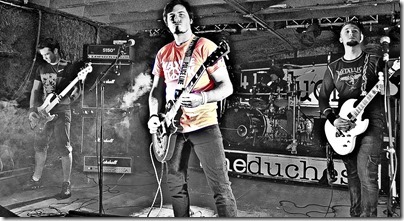 This entry was posted in Live Music and tagged Bastrad, Morpheus Rising, The Duchess. Bookmark the permalink.